Inky Dream: I LOVE YOU Card. I had a lot of fun making this card. Also used up some scraps doing so, but my drawer is still overflowing with small random squares, or paper pieces with Cricut cut shapes missing. Crafts 4 Eternity has a sketch, also RED and a HEART. Charisma Cardz is I Love You theme. FUN! 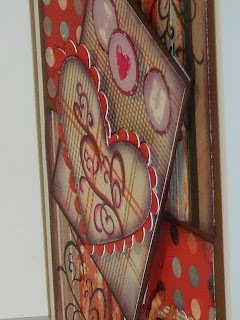 Stampin For the Weekend is Valentine's Theme, and of course, be sure to use a stamped image. Kaboodle Doodles wants spots and stripes. Oh the fun of it all. Thanks for passing by. Hi Farrah, this is just beautiful, love your big heart, your card is just perfect for valentines. Thanks for sharing at C4E this week. Stunning card. Like how you have "popped" it up. Thanks for joining us at Charisma Cardz. There is a lot going on in this card, but it totally works. Love the DPs & all the swirly bits! Thanks for joining us at C4E this week. 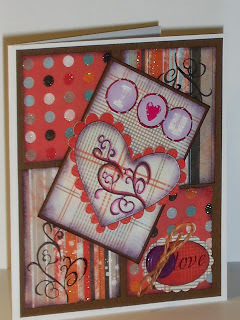 Wow this is so diffrent to any of the other cards I have seen and I love it :D Well done for using up scraps too I need to do a lot more of that!